Yesterday at 15.04h on the 21st October Marty McFly went Back To The Future to save his kids. We were at the Back To The Future event yesterday in the BBH offices London – an event that covered the future face of tech, with leading tech personalities. Very interesting. Equally interesting, and perhaps worth giving some thought to, is looking backwards at what Robert Zemeckis & co thought when looking forward to what the future would look like. What will the TomorrowTV experience be like? 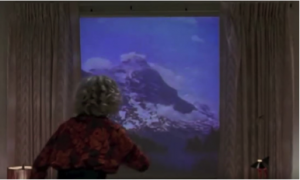 Well, back in the 80s Robert Zemeckis and co thought that there would be multi-screen experiences, and that the TV would not just be used for TV but as a window into our everyday lives (remember the video conference when old Marty got FIRED!?). Well they weren’t far wrong, were they? We @dizmo think it will go beyond having 1 TV per room, rather digitised surfaces that are mere gateways to your digital TV world. You watch Master Chef or James Bond in the bedroom – and then keep on watching it in the kitchen. Multi-Channel Viewing and second-screening – and not just 2nd, but 3rd and 4th and 5th screen monetisation – will become habit not potential. And who could have imagined video communication with metadata streams in the 80s? Now, 30 years later, that metadata resides in the digital video streams and can be monetised for Electronic Sell Through for new ways of monetising content beyond tired ad formats. Verizon FiOS in the US does something similar with the Samsung-funded player Delivery Agent. 2015 Marty’s mother rolled up the blind to take away the interactive image of blue sky mountain top to reveal the grey building opposite. Not so far-fetched and far beyond: touchfoil, projective capacitative and organic LED technology can virtually make this a reality today. In 2014 Sony invented its flexible OLED surface, which they are not actually going to take to market. But Samsung are launching their AMOLED surface both in transparent and non-transparent which they are planning on bringing to market in the short term. So, this ubiquitous computing on any surface, any device, brings up an interesting question: as large and medium-sized screens become cheaper they will enter our daily lives, and pretty quickly. Is the mobile phone going to still be the leading medium to orchestrate our “smart” home lives in this next age of digital living? Left: Who needs roads where we’re going? Finally, if you would have come by our area, you would have seen us flying, hovering and landing our drone from an interactive lightswitch, or control panel, or from a digitised wall, tablet or TV. How’s that for ubiquity?